Nope. C is for Chocolate Chip Cookie. Now I am baffled. 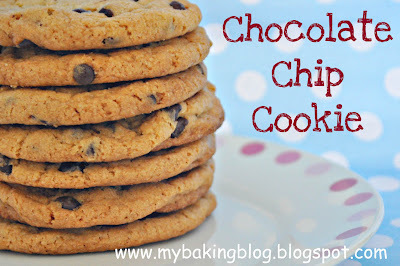 I look at the picture of the stack of chocolate chip cookie at the top of my blog header and I remember I blogged about them quite a long time back, in fact more than a year back. Now I cannot find the post. I probably dreamt I blogged about it then. Now, the important part of this post is here. Haha, I see your eyes following the underlined words. Somebody made an enquiry about ordering a huge batch of chocolate chip cookies the other day. Honestly, it had been a long time since I last ate a choc chip cookie and I almost forgot how the ones at famous chains like Famous Amos and Mrs Fields taste like. And it has also been a long time since I made drop cookies. To refresh my memory (and to check out their pricing), I deliberately drove to buy 3 cookies while I was out running some errands. At the same time, I already had on hand, a recipe I found, which look really good. I took a bite of the choc chip cookie...and I wondered why, I raved and craved for those cookies 15 years ago. Perhaps they tasted really nice 15 years ago? Perhaps my hands were smaller back then and the cookies looked tastier and bigger in my hands? Fast forward to 15 years later, I took a bite and did not feel the wow factor anymore. In fact, I feel it was rather overpriced (yes, I get more stingy the older I get) and actually the older-me now prefers Subway's chewy cookies. Before I had time to debate with people on whose cookies are better, I tried the recipe I found and made some little adjustments as I went along. Each cookie came out nicely rounded. They looked slightly puffed when baked but will be fine when they are cooled. 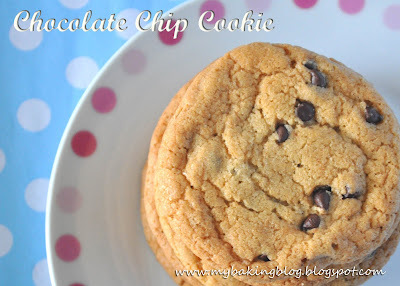 This recipe is supposed to be called a copycat of a famous chocolate chip cookie. But when I took a bite of this, and took a bite of the real Mrs Fields cookie I had, I prefer this. But really, everyone has different preferences, to each his own. If you would like to try these cookies, here is the recipe. Remember to use good chocolate and good vanilla, they make all the difference!